(Newser) – About to be ejected as chairman of Nissan Motors, Carlos Ghosn's future at Mitsubishi and Renault is now very much in doubt. 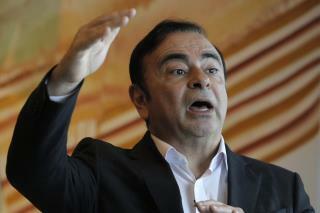 A day after Ghosn was arrested on suspicion of understating his Nissan income by more than $44 million, Mitsubishi said it would ask its board to "promptly remove" the chairman, while France's finance minister said the 64-year-old CEO was "no longer in a position" to lead Renault, which is partially state-owned, per CNN and the BBC. Indeed, Ghosn is likely to spend the next several weeks in a jail cell, the Wall Street Journal reports, noting that Japanese courts typically grant prosecutor requests to hold suspects without charge for up to 20 days after an initial arrest. Gee. This news article means so much to me. Oh, what am I going to do? I might miss breakfast yesterday and lunch. But as they always say, A cricket on the bark of a white ash tree, huh? This case showed that Japanese Corporations cannot "clean up" without whistleblower. and,Japanese Prosecution had wanted to propagandize their Judicial Deal. The only legal interrogations we have in the US without rights of a lawyer is the grand jury. You can have one on the outside of the chambers but not with you as you are questioned. Of course you can just refuse to answer any questions.